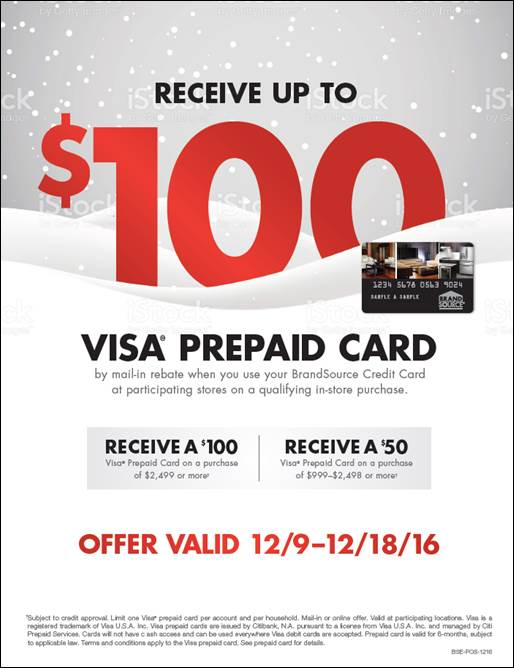 Just a reminder that the December Visa Rebate Promo started Friday! See attached flyer and rebate form. See below for specifics. † Subject to credit approval. Limit one Visa® prepaid card per account and per household. Mail-in or online offer. Valid at participating locations. Visa is a registered trademark of Visa U.S.A. Inc. Card can be used everywhere Visa debit cards are accepted. Prepaid card is given to you as a reward, refund, rebate or gift and no money has been paid by you for the card. Prepaid card is issued by MetaBank®, Member FDIC, pursuant to a license from Visa U.S.A. Inc. No cash access or recurring payments. Card valid for up to 6 months; unused funds will be forfeited at midnight EST the last day of the month of the valid thru date. Card terms and conditions apply, see MyPrepaidCenter.com/site/visa-promo. Since the 2 tiered Visa promotion was so well received earlier this year, we are bringing it back for an encore! Below is a snapshot of the flyer with the dates the promotion will run. Flyers and web banners for the December dates will be sent out soon, just wanted to get the information out as soon as possible for any planning/advertising you may want to do in leading up to the promotion dates. Take advantage of these special promotions, these promos cover 40 of the 60 remaining days of 2016! If you have any questions, don’t hesitate to give me a call!